When life gives you lemons, you make lemonade. When life gives me pecans, I make pecan brownies. 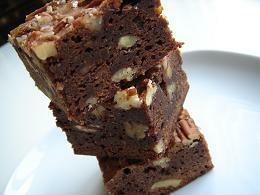 This is one seriously fudgey and chewy brownies overload with sweet buttery pecans. It does not require any special equipments to make either: if you have two large mixing bowls, a knife, and a spatula, you are ready to go. As easy as it is to make, my favourite part of this recipe is definitely about cutting up the chilled brownies the next day. It sounds a little strange but it certainly gives me great pleasure to cut up the big slab of chocolatey goodness into tidy little bars. Preheat oven to 350F. Line a 9X13 baking pan with parchment paper. In a medium saucepan, fill half-way with water and bring to a boil. In a large metal mixing bowl, combine chocolate and butter. Place bowl on top of the saucepan of boiling water without touching the water. Turn down the heat to low. This bain-marie should melt the chocolate and butter with the steam. Stir with rubber spatula occasionally until the mixture is homogenous. Set aside to cool for a bit. In another large mixing bowl, combine brown sugar and eggs. Stir with rubber spatula and let the brown sugar moisten until there's no more lumps. Stir in granulated sugar, vanilla extract, and salt until combined. Combine chocolate mixture with the sugar mixture until homogenous. Gently stir in flour just until incorporated. Do not overmix or the brownies will be tough. Fold in all but 1/2 cup of chopped pecans. Pour mixture into the prepared baking pan and smooth with an offset spatula. Sprinkle with the reserved pecans and press the nuts lightly into the batter. Bake for 35-45 minutes until toothpick insert into the middle of the brownies comes out clean. Cool to room temperature and chill in the refrigerator overnight. The chilling will firm up the brownies nicely which makes for easy tidy cuts. Devour at room temperature. I love egg bread whether it is brioche, challah, or just a plain loaf of humble egg sandwich bread. The golden yellow hue contrasts with the deep brown crust is simply irresistable to me. However, stale egg bread is a totally different animal. Without the fresh aroma from the egginess, the bread looks a little forlorn and I can hardly motivate myself to have a slice even though I enjoyed it so much the day before. In my house, stale egg bread typically turn into bread pudding or pain perdu the next day. However, for this IMBB event, I would like to try something out of my regular repertoire. I remember enjoying pain d'amandes from Boulangerie Poujouran in my last trip to Paris. My memory of this delicious viennoiserie is as vivid as ever so why don't I try to make it at home? This treat tastes best warm out of the oven. The moist egg bread is fragrant with orange and vanilla. The almond cream reminds me of tarts filled with frangipane except that this is sooo much easier to make! Preheat oven to 350F. Line two baking trays with parchment or silpat. In a small saucepan, combine sugar, water, orange juice, and vanilla hull. Bring to a boil for 2 minutes and remove from heat. If your almond paste is not malleable, pulse in food processor until it is crumbly. Cream almond paste, ground almonds, and butter in a standmixer at medium speed until fluffy. With the mixer running, add in eggs one at a time until the mixture is homogenous. Add in almond extract. Add flour to the almond mixture and mix at low speed just until incorporated. Place bread slices on baking tray. With a pastry brush, generously brush each slice of bread with orange vanilla syrup using the cross-stroke. Flip the bread slices and brush the other side with syrup as well. 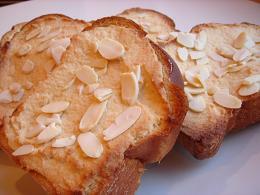 Using an offset spatula, spread a thick layer of almond cream on each slice of bread. Sprinkle with sliced almond. Bake for about 20-25 minutes until almond cream is golden and slightly puff up. Check out the group shot we took at our last practice! I had a strange vision when we were getting ready for the warm-up. You see how a lot of the skaters practice in racing uniforms? Well, since we practice at a track in a school, we don't have access to any facilities to get change. Some people would wear their uniform under their regular street clothes. There we were, peeling off the outer layers to reveal the colourful skin-tight uniform...I can't help but smile because this is like a bunch of superheroes on skates! I've been keeping a log of what we did in our practices for the fitness group. You can find this information under Outdoor Practices in my inline skating blog. My eyes are sore from crying and I've once again activated my "eat less, exercise more" way of numbing the pain. I want to write about something more pleasant and possibly food-related. Some people have tendencies to overeat when they're down. If I fall into that camp, at least I can write about what I stuff my face with. Fortunately (or unfortunately, depending on your point of view), not only do I lose my appetite in times like this, I want to grind my body down until I can no longer feel anything. If there's still such a thing as the bright side, I had a good inline skating practice today. When I concentrated on the drills, the techniques, and basically pushing myself forward with every stroke, my mind was too occupied to feel upset. For the warm-up today, we had to skate around the track backwards for two laps. I've never skated backward before on my inline skates so I surprised myself that I could comfortably do it without too much difficulty. I enjoy the camaraderie at the club and the way that everyone was so excited about the practice. I'm glad I made it out to the practice despite my knee injuries and being so horribly emotional. I have a feeling that I'll write a lot more about my sporting acitivites in the next few days than food & drink. I feel so hollow inside. As I mentioned a few posts earlier, I'm not motivated to cook. This is bad news especially for my brother because we're now on a roll for bland and boring dinner. Tonight, we enjoyed soba noodles in chicken broth with ground veal, sliced cabbage, sliced king oyster mushroom, and baby corn. It did not taste bad, so to speak, just blah. Well, at least it was a well-balanced low-fat meal. How can I get out of this rut? I went to my first Toronto Inline Skating Club practice after work today. Unlike the Toronto Trailbladers, the pace at this club is more intense, more technique-oriented, and waaay faster! I checked out their practice last week and saw that they trained in two groups, the elite program and the fitness program. The fitness group practiced different drills that concentrate on various techniques. I was looking forward to joining the practice this week. I made sure to arrive a little early today because this would be my first guest skate with the club and there were some paperworks to sort out. After spending a whole winter away from my inline skates, I was rusty as expected. In fact, I could not keep up with the speed of the fitness group at all. In spite of that, I really like the way the practice is organized and met lots of awesome people. I made up my mind to join the club this season before the practice session even ended. My goal is to be able to keep up with the fitness group by the end of this season. On a less enthusiastic note, I had my first wipe-out already. We were practicing aggressive slalom (or was it recovery? My memory is already fuzzy) and my right skate leaned a little too much on the inside edge. I heard the frame scratching the ground and next thing I knew, I went down hard. Fortunately, I was going quite slow so the fall didn't travel far. However, I now have scratches on my left knuckles (argh, blood), a tiny scratch on my right palm, a huge scratch on my left knee (that's my bad knee), and worst of all, badly swollen and bruises on both of my knees. As soon as I got up, I made a beeline over to the first-aid box and taped up all the open wounds. The wounds stung a little but it didn't hurt very badly so I continued on with the practice. Only after I had gone home did I realize how badly hurt they really were. I made a stop at the supermarket and got myself an armful of first-aid supplies. I'm alright now but once again, I had to spend my evening with tensor band (I got a new one!) and my ice-packs. I think I may need to take a break from baking until the wounds on my hands heal [grumble grumble]. I've been in a dinner rut for the last couple of weeks without any motivation to cook. Between the miserably rainy weekend weather and fatigue from dragonboat practice, I decided to have a quick easy dinner at home on Saturday instead. Both T and I love Japanese-style curry...it's one of those dishes that can prompt us to finish a ridiculous amount of rice without even trying. We typically like to have carrots, lots of potatos, onions, and pieces of chicken thighs in our curry. However, I've never been keen on handling raw meat. The mere thought of cutting the chicken thighs into bite-size pieces did not sound at all inviting to me especially since I was so tired. As I continued to aimlessly browse through the meat aisle in the supermarket, it suddenly dawned on me to make meatballs with ground chicken. I've never made meatballs before in my life nor have I seen people make meatballs either. The logical thing to do would be to look up a recipe from the trusty The Joy Of Cooking. I was lazy beyond believe though and decided that I could just wing it. Now, what go into meatballs? Ground meat and seasoning, obviously. There must be some fillers too...that must be why the supermarket stocks breadcrumbs. I never use breadcrumbs in my cooking but I did have a bag of frozen homemade mini corn muffins in the freezer. So, in they went to the Cuisineart. I think I need a binding agent of some sort...let me just crack an egg. I mixed everything together and shaped the mixture into little round balls. I browned the meatballs in a frying pan and voila! Perfect protein to soak up the curry roux in an instant. The instruction on the instant curry asked for simmering the meat and vegetable in water until tender. I remembered the instant curry cook-off article from a recent issue of Orange Page which one of the guys replaced part of the water with milk. I did the same and I was so pleasantly surprised by the richness imparted by the milk. The enriched curry roux with chicken meatballs, carrots, Yukon Gold potatos, and onions was absolutely delicious. After two large bowls of rice, my mood was noticeably better and I was happy to have a new dish in my cooking repertoire. It just occurred to me today that I rarely make desserts for myself. I bake for many reasons: customers at Linda, friends & family, research, or just out of curiosity of a recipe that stirs my interest. For these kinds of purposes, my desserts are typically complex. However, what I really like to eat and what I want to bake for myself is usually very simple and rustic. I love apple pies but when I don't want to wait overnight for the pie dough to relax, I would satisfy my craving with apple crisp instead. Apple crisp is one of the few things that are so simple to make that I can even make it on ski trips with poorly equiped kitchens. One added bonus...the house always smells delicious when there's an apple crisp baking in the oven! Preheat oven to 375F. Butter a 2 1/2 quart deep baking dish. Peel and core the apples and chop into medium pieces. Toss with lemon zest, lemon juice, granulated sugar, corn starch, and cinnamon. Leave at room temperature for about 10 minutes so that the sugar draws out the juice from the apples. Using a food processor, pulse the remaining ingredients until they look like coarse crumb. Pack the apples and all the juice into the baking dish. Top with crumb topping. Bake for 60-75 minutes until the apple crisp is golden brown and you can see some of the juice bubbling. I like to enjoy the apple crisp right out of the oven with a generous topping of cinnamon creme anglaise. It tastes equally great at room temperature the next day. Our dragonboat team had our first on-water practice today in the cold, windy, rainy weather. EC, our team manager, gave us plenty of warning about the chill. Since I practiced in these kind of condition before, I wasn't particularly concern. What worried me was the fact that we would run 2km as warm-up exercise. Running/jogging has never been my forte and I routinely avoid the treadmill when I do cardio exercises at the gym. I wasn't sure that I could continuously run this distance without slowing down to walking pace in order to catch my breathe. Well, there was only one way to find out so I diligently ran 2km on the treadmill on Wednesday and Friday. My practice-runs at the gym went well. I managed to finished the distance at a speed of 4km/hr in 30min without slowing down. With these two practices under my belt, I was pretty confident that I could keep up with the team on Saturday. And boy, did I keep up! We started to run with TK and about six or seven guys leading the pack. I know that KS was running right behind me and she's very physically fit (c'mon, she bikes or runs to our practices from her home!). As we passed the one kilometre mark, several guys began to slow down but I managed to keep up my pace. Slowly but surely, I started to pass some guys in front of me. When we finished the course, I managed to be the fifth! Boy oh boy, I was sooo excited!!!! The on-water practice was far less exciting although I was glad to return to the groove I hit last time with the A-frame and body-twisting position. I was paddling on the third row and the people in front of me were experienced paddlers from the team. I found their pace a little too fast sometimes but it's amazing how nice it is to follow people who have good form. See, the thing is, when they paddle in a very rhythmic fashion, it's much easier for me to follow suit and in turn, I paddle in better form too. So, a big thank you to RJ and JS! I'm looking forward to our next practice...especially since I got a new pair of Zen Capri from Sugoi. Those should keep me warm better than my board shorts & bare legs. It's amazing how I need to invest in a new helmet for (almost) every new sport that I take up. Over the last few years, I acquired two snowboarding helmets (Giro Fuse rocks!) and a hockey helmet. I was close to getting another one for horseback-riding until I decided that I'm not that fond of grooming the horses. I put off purchasing one for inline-skating all these years even though I've been blading my way around anywhere from Toronto to Niagara-on-the-Lake to Hamilton to Paris. Since I am required to wear a helmet for the Toronto Inline Skating Club's practices, I finally bought a nice blue and white bike helmet today. I am now up to four helmets in my collection. This got me thinking...can you judge how active a person is by their HAI, Helmet Activity Index? Honestly, any activity that requires a helmet (or as HT fondly calls "brain bucket") is risky in one way or another. You wouldn't imagine people wearing helmets for bowling or golf, wouldn't you? Assuming the helmets are not sitting on the shelf gathering dust, I think this is a pretty good indicator. Take my friend AL for example, he must own at least six helmets! So next time that you meet someone new, why don't you ask them how many helmets they own?